Welcome to the "All I Want For Xmas Is Asian Beauty" Giveaway Blog Hop! 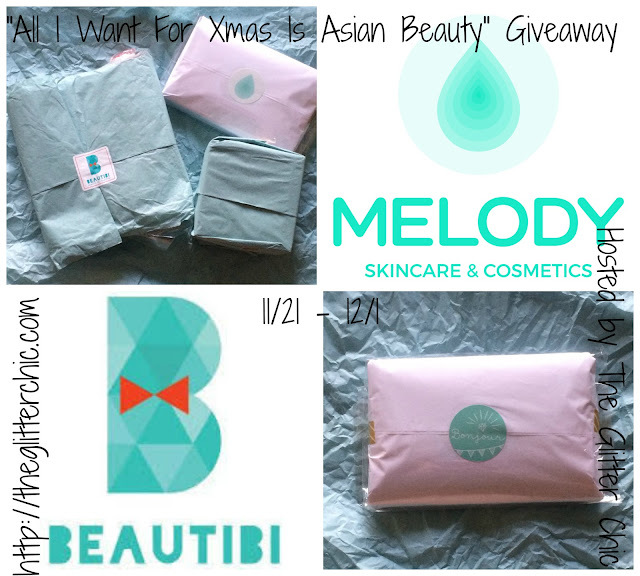 At the bottom of this post you'll find a list of other blogs hosting an Asian beauty themed giveaway right now along with me. I hope you enjoy the giveaway I've put together for you, and that you check out the other giveaways in the hop to increase your chances of winning a prize! This giveaway will have two winners, and it will be open worldwide, so anyone can enter! I've previously posted "Sponsor Spotlight" posts with a small highlight of each sponsor, and what they've contributed to the giveaway, but here's a brief recap. Beautibi is one of the two sponsors of this giveaway, contributing an Annie's Way Jelly Mask, a Brighten Up Face Sheet Mask Variety Pack, and a LadyKin Watermelon Icing Gel Bar. These prizes will make up part of the "Grand Prize" I'm giving away below. Melody Cosme is the second of my two sponsors of this giveaway, contributing two Lovemore Fresh Direct Import Series sampler packs, each including six masks. One of these sets will be added to the "Grand Prize" and the second set will be a secondary prize for another winner! So what do you need to do to win? Giveaway ends December 1st at 11:59pm cst. Julia has won the "grand prize" for this giveaway, and Julie has won the mask-pack prize. Please don't be discouraged if you didn't win this time around, there will be more giveaways in the future! Disclaimer: The Glitter Chic blog received the product(s) mentioned in this post for the purpose of hosting a giveaway. No monetary compensation was received for this post. The Glitter Chic blog will always provide honest opinions, beliefs or experiences on products reviewed. If you have any questions, please contact me at gothickornchic at gmail dot com. This blog contains affiliate links and I may receive a small commission if you make a purchase using one of those links. The Glitter Chic is not responsible for prize delivery. The disclosure is done in accordance with the Federal Trade Commission 10 CFR, Part 255 Guides Concerning the use of Endorsements and Testimonials in Advertising. Thanks for doing this Samantha! I love Asian beauty products! I'd like to try the Acwell Bubbling Cleanser from MelodyCosme. Annie's Way Jelly Mask!!! I want to try that so bad!!! So amazing! I want to try the jelly.mask!! Also, from Melody I'm interested in her ACWell items as well as Lovemore masks. From Beautibi, I really want to try some Beaute Forest and Ladykin items. From Melody, I'd like to try the Acwell Aqua Clinity Cream. From Beautibi, I'd like to try Beaute Forest since I liked the masks by L'Herboflore! Lovely giveaway. What I most excited about? all the sheet masks. From Beautibi the LADYKIN WATERMELON ICING GEL BAR looks amazing! From Melody Cosme the cleansing toner from Acwell looks awesome! I'm most interested in LadyKin snail cream from Beautibi and COSRX Ultimate Moisturizing Honey Overnight Spa Mask from Melody Cosme. I've never really had a chance to try any masks before, so I'm most excited about the masks! The Acwell licorice toner looks really interesting. The L'HERBOFLORE ORIENTAL HERBS COLLECTION SET looks amazing! I'm always on the lookout for new masks to try. Thanks for hosting the giveaway :) Love sheet masks esp Lovemore. I am drooling over the Acwell, oh man licorice! ! I am most excited about the Annie's Way Jelly Mask, I would love to try that one! Thank you for this giveaway!! I've heard soooooo much about Lovemore and I'd love to try some of their masks! Thanks for the giveaway! The Hanaka Intensive Renewal Facial Mask from beautibi looks so cool, would love to try it! The L'herblore masks from beautibi looks the most interesting! I've been seeing all the hype for the all over reddit so I'm trying to resist buying them. I saw that they had a Lovemore sampler that is free after you spend $75. Another great way for me to try another brand of sheet mask that is well talked about. Thank you for giveaway^^ I wanna try really badly lovemore masks. I heard good things about them but I'm quite picky if it comes to sheet masks so I wonder if I will like them too :). The annie way's mask from beautibi and the lovemore masks from melodycosme! I'm excited for the Annie's Way mask! At Beautibi I like the L'herbflore masks!